It’s hard to remember where I first heard of a TV show that has been written about as extensively as Girls. I don’t think it was on KYD, or Liticism, or Jomad Meets The Rereaders, or this wonderful memoir about job-hunting, but probably either on Daily Life, or in this analysis of race on The Hairpin. I watched a three-minute clip that seems to have been taken down now of one character reading out advice from an advice book and instantly recognised myself, reading out advice from advice blogs to friends suddenly navigating the grown-up problems of work and relationships and sexism (see, a blog post I did collating the wisdom of advice bloggers I shared most often for easy reference). I laughed out loud and mentally added the show to my to-watch list. But I also gathered from the flood of opinions on the internet about this show that the protagonist was a writer in her mid-twenties who was struggling to get paid for her work after spending two years as an unpaid intern supported by her parents after finishing a liberal arts degree. This hit even closer to home – I might not have spent two years in an unpaid internship, but, aged in my mid-twenties, I had only just started full-time work as a journalist after doing an arts degree concurrently with many internships/volunteer programs, while my parents had offered generous help in the hopes that a tertiary education would open up better opportunities for me than were available to them. I watched my twenty-something writer friends, many of whom have also interned and volunteered and written for free (and worked in retail/admin/hospitality to pay rent), posting links to think pieces about Girls and discussing the show at literary festivals. I want to be paid for my work. This is not unreasonable. I want my writer friends to be paid for their work. And I wanted twenty-something screenwriter and creator of the show Lena Dunham to be paid for her work, although it later turned out I didn’t need to worry too much because she got a reported $US3.5+ million advance to write a book. 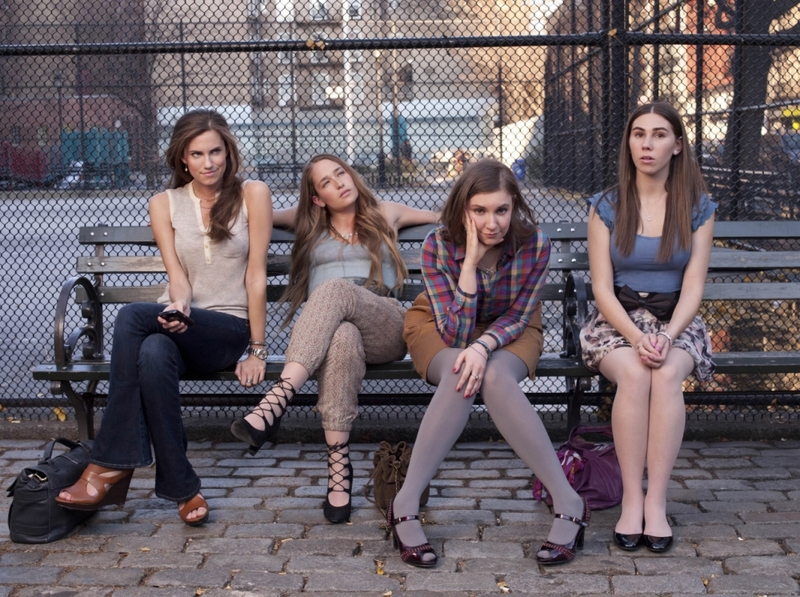 So in a fit of principle, I refused to download Girls and opted to wait for the DVD release. And then ages ago I saw that the DVD was out, and then it was time for the second season, and the third, and I realised that even though I told myself I’d been busy and I always have a large pile of things to watch and read, I had kind of been hesitating to watch Girls because of my privilege guilt. I was a bit scared that watching a character ask her parents for only $1100 a month while she wrote her memoir that she had to live first because she might be the voice of a generation would be a bit like looking in a very uncomfortable mirror. AND THEN someone told me at a party that the show was a bit disturbing and I should make sure not to watch it alone, which, since I live by myself, was an extra discouragement – I made some tentative plans for a DVD party with a writer friend but then never followed up. But last week, Christmas present money in hand, I wandered in to JB Hi-Fi and bit the bullet. The first season DVD was $37.98 and at first I was like, “Thirty-eight dollars? The other week I bought an old season of 30 Rock for ten!” until I remembered my ideals about wanting to do something to pay Lena Dunham for her work despite knowing she would only collect a small fraction of DVD sales revenue. It turned out the shop was having a sale and the DVD was 20 per cent off, which if you’re playing at home is $30.384 (yes, I am a serious business journalist now and regularly list prices in fractions of a cent). So now I am going to watch this show, and if I tell you afterwards that I really need to talk to you about this thing that happened on season one of Girls and you’re struggling to remember because it was so long ago, maybe smile indulgently at my ideals, okay? Okay. Make sure not to watch it alone? It’s hardly Wolf Creek, I think you’ll be fine.